There are many investors who prefer to remain invested in stocks at all times. Perhaps they think tactical allocation is some kind of voodoo. Maybe they have a strong psychological bias against occasional whipsaw losses and do not mind bear market drawdowns. Maybe they have institutional constraints requiring them to always be in stocks. 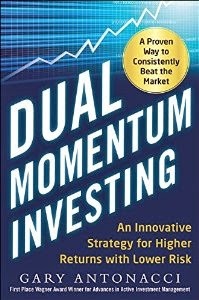 Whatever the reason for their buy-and-hold orientation, let us see how they or anyone can use relative momentum (half of dual momentum) to get improved investment results. Our core holding will be the S&P 500. To use relative momentum, we need at least two assets. We will use the MSCI All Country World Index ex-US (ACWI ex-US) as our second one. Each month we will invest in whichever of these two has performed better over the preceding 12 months. Here are the results from January 1971 through February 2016 for this simple momentum approach rebalanced monthly. 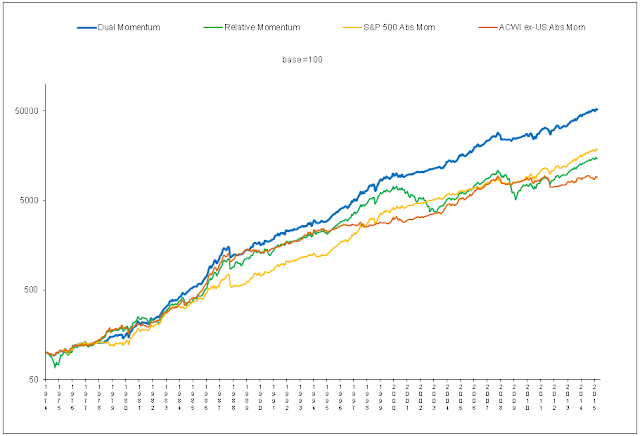 Relative momentum allocates to the S&P 500 55% of the time and to the ACWI ex-US 45% of the time. Transaction costs are negligible, since there is on average less than one trade per year. There is also little in the way of tracking error and no whipsaw losses where you are left on the sidelines as the stock market advances. Using relative momentum, there is almost a 300 annual basis point increase in return compared to holding each asset or a blend of both assets! Look closely at the following performance chart to see how these increased profits come about. From 1975 through 1990, ACWI ex-US outperformed the S&P 500. Relative momentum invested in the ACWI ex-US similarly outperformed. The S&P 500 did better than ACWI ex-US from 1990 through 2000. Relative momentum switched over to the S&P then and so also outperformed the ACWI ex-US. Both indices moved together until 2003 when ACWI ex-US outperformed the S&P 500. Momentum switched back to the ACWI ex-US and beat the S&P 500. In 2009, the S&P 500 took the lead again ,and momentum once again moved higher with the S&P 500. 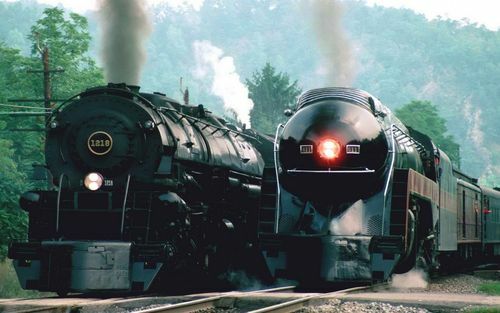 It is as if each time a faster train comes along, relative momentum hops on board to win the investment race. Who would not do something like this to earn an extra 300 basis points per year? You could easily do this strategy using broad-based U.S. and non-U.S. stock index funds in 401K retirement accounts and variable annuity contracts. If you do not want to bother checking SharpCharts monthly to determine the funds’ annual returns, you can set up a free account with Morningstar. They will regularly email you the annual return information. The only concern I have heard about this strategy is that the world is now more globalized. There may no longer be as much to gain from geographic diversification. It is true that many large corporations derive a significant amount of their revenue from international operations. But corporate profits have little to do with the difference in return between U.S. and non-U.S. stocks. As the following chart shows, the relative performance of these markets depends largely on the strength or weakness of the U.S. dollar. When the U.S. dollar is strong, U.S. stocks tend to outperform non-U.S. stocks. Non-U.S. stocks outperform when the U.S. dollar is weak. Our simple relative momentum strategy takes advantage of global macro-economic trends. Just as it does not make sense to be simultaneously long and short the U.S. dollar, so it not the best idea to be long U.S and non-U.S. stocks at the same time. It would be better to own U.S. stocks when the U.S. dollar is strong, and to own non-U.S. stocks when the U.S. dollar is weak. Relative momentum automatically puts us on the right side of this macro-economic trend. There is no need to pay for global macro management. There are two types of diversification in the world of investing. The usual method of vertical diversification stacks one asset up on top of others. It owns them all at the same time, which means some will underperform and create a drag on performance. 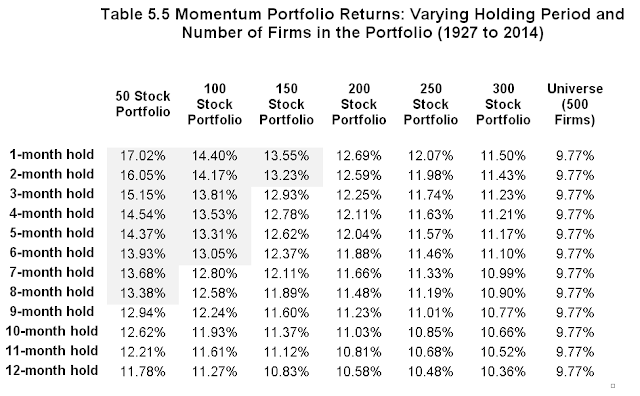 Momentum uses horizontal (or temporal) diversification that invests only in the strongest asset(s). As we saw in the chart above, this translates into higher returns as we move forward in time and rotate our exposure to the strongest asset. Momentum thus depends on persistence in performance. 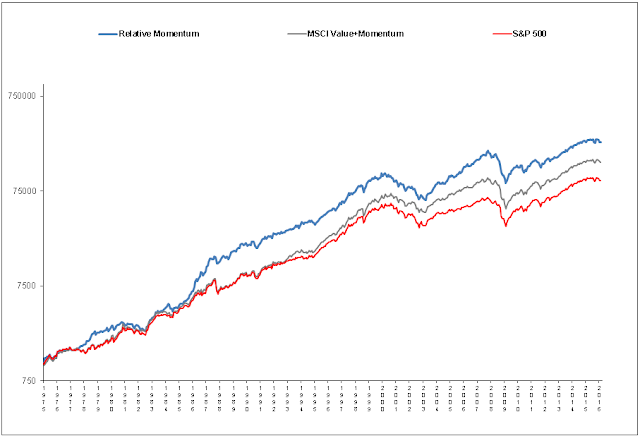 Momentum improves the performance of nearly every asset class from the year 1800 to the present . Let us compare our macro momentum strategy to a multi-factor approach with individual stocks. We will use the two most popular factors: value and momentum. Value and momentum represent the two strongest anomalies. Others have also argued that they complement each other and perform well together. For value, we use the MSCI USA Value Index that selects the top half of large and mid-cap stocks on the basis of price-to-book, price-to-forward earnings, and dividend yield. This index currently holds 319 stocks and has a 17% annual turnover. 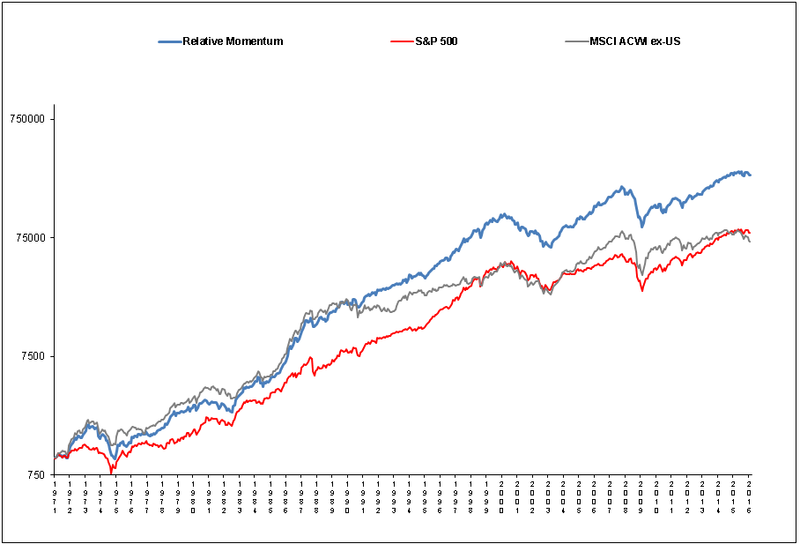 For momentum, we use the MSCI USA Momentum Index that selects the top 30% of large and mid-cap stocks based on a combination of 6 and 12-month momentum adjusted for volatility. This index currently holds 122 stocks and has an annual turnover of 137%. Both MSCI indices rebalance semi-annually and began in January 1975. None of the indices accounts for transaction costs. Here is our macro momentum strategy compared to the 50/50 split between these two MSCI indices from January 1975 through February 2016. Our macro momentum approach had the highest Sharpe ratio. It returned an average annual 150 basis points above the combined stock momentum plus value portfolio. It also had a strong 270 basis point annual return advantage over the S&P 500. But that is not the whole story. We should also consider scalability issues and transaction costs. Holding fewer stocks and rebalancing more frequently leads to higher returns. The following table shows compound annual growth rates (CAGRs) of value-weighted portfolios using a universe of the largest 500 U.S. stocks. 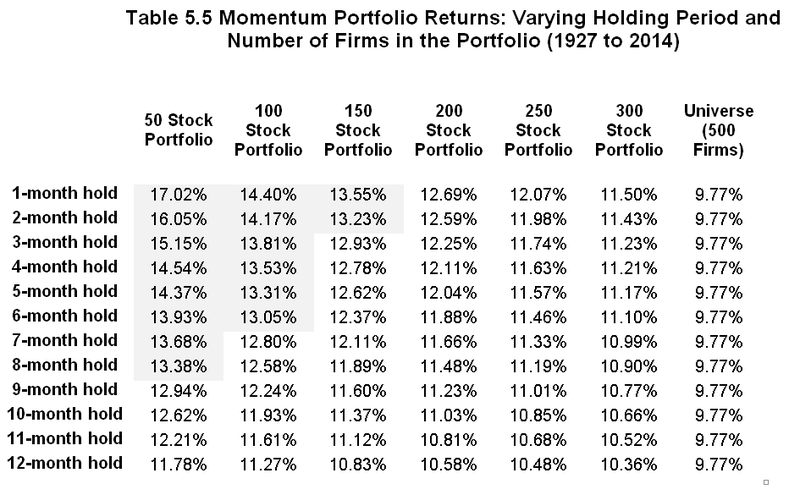 The ideal stock momentum portfolio is highly concentrated and rebalances monthly. Momentum fund managers know this, and nearly all of them limit the size of their momentum portfolios to 150 or fewer stocks. Ten of the twelve momentum funds also rebalance their portfolios at least quarterly. The MSCI momentum index that rebalances semi-annually rather than quarterly has an annual turnover of 137%. Passive indices like the S&P 500 or the ACWI ex-U.S. have an annual turnover of only around 3%. In 2006, there were no publicly available momentum funds. Today there are a dozen funds dedicated to U.S. stock momentum. There are also more than a dozen multi-factor funds using momentum (see “Multi-Factor Investing”). Every month AlphaArchitect posts the top 100 stocks based on 12-month momentum. So momentum investing with individual stocks is no longer a neglected strategy. In their paper, “Are Momentum Profits Robust to Trading Costs?” Korajczyk and Sadka (2004) show that momentum profits drop to zero once the amount of momentum assets reaches $2 to $5 billion. We are already well past that level. Imagine what will happen when hundreds of billions of dollars tries to trade the same small number of momentum stocks each quarter. Related to scalability is the issue of transaction costs. In “The Illusory Nature of Momentum Profits,” Lesmond, Schill, and Zhou (2002), use a conservative procedure to estimate annual stock momentum trading costs at nearly 7%. This reduces stock momentum profits down to near zero. Momentum is not only a high turnover strategy, but momentum stocks are often more volatile and have higher bid ask spreads. Frazzini, Israel, and Moskowitz (2012) of AQR argue that momentum trading costs are manageable based on 12 years of proprietary transaction data from 1998 through 2011. But that data was of many types of stocks, not just ones with high momentum. Jason Hsu PhD, co-founder of Research Affiliates, has a forthcoming report showing large-cap stock momentum returns with quarterly rebalancing being less than the large-cap market return due to trading costs. Since our relative momentum strategy uses stock indices, scalability is not an issue. We can trade almost unlimited amounts of capital in broad-based U.S. and non-U.S. stock index funds with hardly any impact on trade executions. Transaction costs are also a moot point. There is less than one trade per year with this approach. The simple momentum strategy presented above can help buy-and-hold investors meet their investment goals without the uncertainties associated with high transaction costs, scalability, or other similar factors. 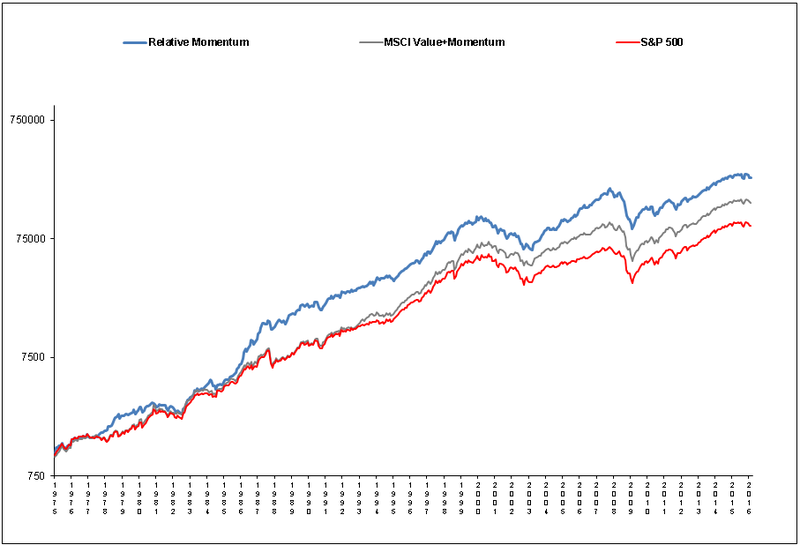 Even without adjustments for those factors, our simple momentum strategy showed an annual 150 basis point advantage over stock momentum combined with value, and a 270 basis point advantage over the S&P 500 index. See Geczy and Samonov (2015), “215 Years of Global Multi-Asset Momentum: 1800-2014 (Equities, Sectors, Currencies, Bonds, Commodities and Stocks)”. They show that momentum is consistent and robust. It works well with and across different asset classes. It works best, however, with geographically diversified stock indices.